Bypass Diodes are used in solar photovoltaic (PV) systems to protect partially shaded PV cells from fully operating cells in full sun within the same solar panel when used in high voltage series arrays. Solar photovoltaic panel are a great way to generate free electrical energy using the power of the sun. You just place them wherever you want and away you go either as part of an off-grid stand alone system or as roof installed PV panels for a grid connected system. The power range of a solar photovoltaic system is extremely wide, from a few milliwatts to hundreds of megawatts due in part to the modularity of the solar panels. Photovoltaic cells are a type of semiconductor photodiode that directly converts the light hitting their surface into electrical power. Photovoltaic systems generate electricity by connecting solar PV panels together in the form of an array, and exposing them to the direct sunlight. We would think then that during normal operation all the solar panels of a PV system would experience the same solar conditions as they all form part of the same solar array. However, the electrical generating performance and reliability of a PV system can be affected by external factors, such as environment, temperature, humidity, positioning, and degree of solar radiation which can all lead to power degradation. But as well as these obvious environmental factors, one factor in particular that will lead to mismatches between solar cells or whole panels, and power degradation within a solar array is shading, that is the blocking of the sunlight onto the cell, or panel by leaves, trees, buildings or antennas. This can be either full or partial shading, and depending on the degree of shading, will cause a decrease of output power. 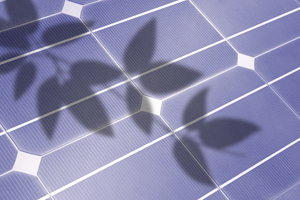 Photovoltaic (PV) panels are made from interconnected crystalline silicon cells and are therefore sensitive to shading. In a standard PV panel, these solar cells are connected together in series, result in high voltage but the same value of current flows through all the connected cells. So as long as the sunlight hitting the surface of the PV panel is uniform, each photovoltaic cell within the same panel will produce the same amount of electrical voltage, approximately 0.5 volts. So for instance, at full sun a 2 watt PV cell will produce a constant current of about 4 amperes, (0.5 x 4 = 2 watts). If however, a cell becomes shaded by some external means, it will stop producing electrical energy and behave more like a semiconductive resistance, strongly decreasing the total amount of energy produced by the solar panel. For example, lets assume we have three series connected 0.5 volt photovoltaic cells with a solar irradiance of 1kW/m2 across all three photovoltaic cells as shown. As the three PV cells are connected in series, the generated current (I) will be the same (assuming the cells are evenly matched), and the total voltage, VT is just the sum of the individual cell voltages, (V1 + V2 + V3 = 0.5V + 0.5V + 0.5V = 1.5V) so the I–V characteristic curves of the three cells are simply added along the voltage (horizontal) axis as the current is common and constant. Using our 2 watt cell example from above, the maximum power point for this series string would therefore be: 6 watts, (1.5V x 4A = 6W). Now lets assume that Solar Cell No2 in the string has become either partially or fully shaded while the remaining two cells in the series connected string have not, that is they remain in full sun. When this occurs, the output of the series connected string will reduce dramatically as shown. What happens here is that the shaded cell stops producing electrical energy and behaves more like a semiconductive resistance. The shaded cell generates less current than the other two cells strongly decreasing the energy production of the series string. The result is that the power being generated by the “sunny” cells is now being dissipated by the “shaded” cell which can, over time, cause overheating (hot spots) and eventually destruction of the bad cell. As the shaded cell causes a drop in its generated current. The unshaded good cells adjust to this current drop by increasing the open-circuit voltage along their I-V characteristics curves resulting in the shaded cell becoming reversed biased, that is a negative voltage now appears across its terminals in the opposite direction. This reverse voltage causes current to now flow in the opposite direction through the shaded cell resulting in it consuming power at a rate depending on ISC and operating current, I. Thus a fully shaded cell will experience a reverse voltage drop under any current conditions and therefore dissipate or consume electrical power rather than generate it. So how can we protect a photovoltaic cell, panel or even a full array from the destructive effects of partial or full shading. One simple and effective way to protect photovoltaic cells from against the destructive effects of cell shading is to connect what is called a Bypass Diode across each PV cell of a series-connected string. Bypass diodes are connected externally and in reverse parallel with a PV cell to provide an alternative electrical path for the generated current to flow as it cannot flow through the cell when shaded. This helps preserve the performance of the series string by restricting the reverse bias voltage generated across any partially shaded cell and hence reduce the electrical power which can be dissipated by the cell. Consider our three series connected PV cells below with bypass diodes added. Bypass diodes have been connected in parallel across each of the three PV cells. These externally connected bypass diodes are connected in reverse bias mode across their respective cell, that is the diodes Anode terminal is connected to the positive side of the cell while the diodes Cathode terminal is connected to the negative side of the cell. When the three solar cells receive full sun, they each generate a voltage as normal, and as each of the three bypass diodes are reverse biased across their respective cells any reverse current (red arrows) trying to flow through them is blocked. Thus being reverse biased, the diodes act as if they are not there with the series string producing full output power (6 watts in the previous example) as the three solar cells are working as expected. However, if as before one of the PV cells becomes partially shaded due to leaves, trees or snow, etc. the shaded cell does not produce and electrical energy as we have seen above and thus their bypass diode takes over becoming activated as shown. Here under the condition of shading, cell two stops producing electrical energy and behaves like a semiconductive resistance as we discussed before. Due to the shaded cell generating reverse power, it forward biases the parallel connected bypass diode (i.e. it turns it “ON”) diverting current flow of the two good cells through itself as shown by the green arrows above. Thus the bypass diode connected across the shaded cell maintains the operation of the other two PV cells by creating an electrical path for the generated current to flow along. Then although one cell is shaded (cell 2 in this example) the other two cells, 1 and 3 continue to generate energy but at reduced power. Thus as in our previous example above, the output would be using our 2 watt cell example from above and assuming no losses through the bypass diode, 4 watts (1.0V x 4A). One other advantage of parallel connected bypass diodes is that when forward biased, that is when they are conducting, the forward voltage drop is about 0.6 volts thus limiting any high reverse negative voltage generated by the shaded cell which in turn reduces hot spot temperature conditions and therefore cell failure, allowing the cell to return to normal once the shading has been removed. The integration of a bypass diode across each individual single cell as we have done above in our simple example would be too expensive and not that easy to install. In practice, manufacturers place bypass diodes across groups or sub-strings of PV cells (typically 16 to 24 cells) in the back of panels or within the junction box of a solar module. Thus for example, two bypass diodes would be sufficient for a solar panel with a rated power of about 50 watts containing between 36 to 40 individual cells. Many high end solar panels have them fabricated directly onto the semiconductor photovoltaic cell structure. While it is possible to connect any type of diode to the back of a solar panel, the type and selection of a bypass diode depends mainly on the current and power rating of the cells, and/or panels, it has to protect. The most common type of bypass diode used is the Schottky diode with current ratings ranging from 1 to 60 amperes and voltage ratings of up to 45 volts, which is more than enough for a single 12V or 24V battery charging solar panel.